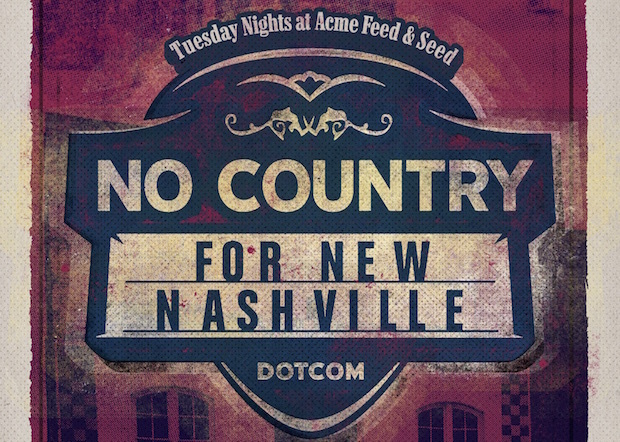 The summer is powering on, and our long-running showcase series at Acme Feed & Seed is still going strong. We’re switching back to a three band format for the time being, so get ready to be wowed by three hours worth of free live music! Our next, packed out gig will take place Tuesday, August 8 and the bill will feature southern rockers Them Vibes, pop performer James Hatem, and, for a return engagement, singer-songwriter Jared Hard. Things kick off at 7 p.m., so don’t be late, and read on after the break for a full preview. Formed in East Nashville in 2013, Them Vibes embody the esthetic of The Rolling Stones with a sound akin to The Black Crowes and are more ’70s southern rock nuanced than any of their Music City contemporaries. They released their debut record, Shine On, independently, and soon after, they began to build a name for themselves around town with their incredibly uptempo live show, and powerful songwriting. The group fellowed that up with a stellar sophomore effort, an EP entitled TV, from which the hit single “Lorelei” gained them heavy airplay from Lightning 100. Since then, they’ve brought their live show to festival crowds at Austin’s SXSW, opened for The Flaming Lips at the Sound Harvest festival, headlined at the Tomato Music and Arts Fest, and opened for some classic southern rock artists like Lynyrd Skynyrd and Molly Hatchet. Their latest release, Electric Fever, was recorded live as a full band at Addiction Studios in Nashville, to try to capture the energy of their live show. We can assure the record is more of the same kickass rock and roll we’ve come to know and love from Them Vibes, but your best bet is to see the spectacle live for yourself. We are ecstatic to finally be hosting them in our showcase, and this one is not to be missed for people who love local rock in its purest form! Originally hailing from New Jersey, James Hatem came to Nashville in pursuit of his musical endeavors, and was immediately struck by the supportive and creative community thriving in our fair city. Still relatively green in terms of released recorded material, Hatem’s three singles, “Satellites and Stars,” “The Middle,” and “Summer Air,” caught our attention, and left us wanting more, and the word is he’s killer live. With a stellar backing band, and breadth of influences ranging from John Mayer to Ed Sheeran and Zac Brown Band, James is ready to show everyone he’s a primetime player. So make sure you get to Acme on time, to support another fresh face in our ever growing local scene, and get in on the ground floor with a possibly big time band in the making. We liked Jared Hard‘s first go ’round at Acme so much, we asked him back! Growing up the third of four children, in a music loving family, Jared might have had bit of a head start on other singer-songwriters. In fact, some of his earliest memories involve singing with his siblings around the family piano, or participating in the hymnals at his local church. By the time he was just eight years old, he was experimenting with songwriting; jotting down poems and learning guitar. Fast forward a decade and a half, now Jared calls Nashville home, and he is pursuing his passion for creating original music. Don’t miss out, because everything we’ve heard form his record 10,000 Hydrogen Bombs is stellar, and we can already say from experience that he translates perfectly live. Them Vibes, James Hatem, and Jared Hard will perform Tuesday, August 8 at Acme Feed & Seed. The show is 21+, begins at 7 p.m., and, per usual, it’s totally FREE!